Today, we celebrate the Holy Cross “on which the Prince of Glory died.” (LSB #425) To be sure, the cross is not 'holy' in and of itself. •	In fact, in and of itself, the cross is just two pieces of wood joined together with rope and nails. •	In and of itself, the cross is a terrible instrument of torture and execution invented by the Persians, developed to cruel excess by the Romans to inflict the maximum amount of suffering and pain over the longest period of time. When the Jews said that anyone hung on a tree had to be cursed by God, the 'tree' that they were referring to was the cross. •	In and of itself, the cross is offensive and repulsive. But we call it 'the HOLY Cross' because the Holy Son of God was crucified on a cross. And by His suffering and death upon this wood used for the cruelest torture and punishment, Jesus Christ has brought life and salvation to the world. The date of September 14th was originally established for this Festival Day based on the supposed recovery of the actual cross on which our Lord was crucified. A woman named Helena, who was the mother of the Roman Emperor Constantine, conducted extensive archaeological excavations in and around Jerusalem. In September of 320 a.d., the site that had been called “Golgotha” was presumed to be found. And on that site, three crosses were discovered – one of which was presumed to be the one on which Christ Himself was crucified. A basilica was built on that site, and in 335, the remnant of that 'cross' on which Christ, our Lord was crucified, was housed in the Basilica of the Holy Sepulcher. To be sure, we do not hold any superstitious fantasies about a piece of wood on which our Lord may or may not have actually been crucified – any more than we hold any superstitious thoughts about the crucifix on our altar or the crucifix I wear around my neck or the cross jewelry we wear. These are only 'symbols.' And the purpose of 'symbols' is to point to something beyond themselves, and not to the thing itself. 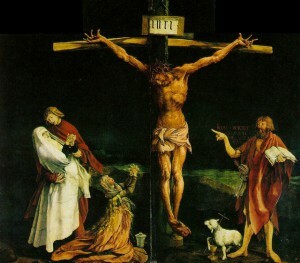 It's not the cross itself that we worship and adore – but all that the cross points to – which is the ineffable love of the almighty God that He was poured out onto this fallen, corrupt and sinful world through His perfect, innocent, holy Son, who suffered the punishment that we deserve, by bearing them in His body unto death, even death on a cross. •	Whereas we would look for the confirmation and proof of His love for me in the successes and advancements and achievements and securities and the comforts that He graciously gives me, He shows us the confirmation and proof of His love for me in the shame and humiliation of suffering and pain and gruesome death that He endured for me. •	The cross shows us that God is more tormented and wracked with grief because of our sin than we are. •	The cross of Christ shows us that God has determined that our condition is so utterly hopeless and beyond repair that there is no possibility that we might be renovated or reformed, but that we must be put to death and buried and then raised up again a whole new person. •	The cross of Christ shows us that He must do it all FOR US, on our behalf, in our place, even while we are still sinners and enemies of God. (Romans 5:8-10). –	to the end that we might live for Christ.